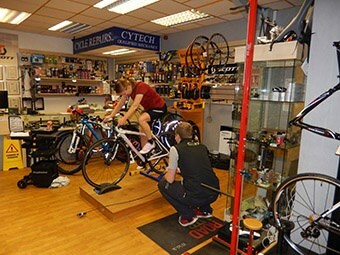 Professional Bike fitting services in Scotland, West Lothian. Welcome to Hooked on Cycling cycle superstore in Bathgate, West Lothian, Scotland. Hooked on Cycling offers professional bike fitting services in Scotland using a bike fitting jig and software all the way from Italy. We also have in store a Watt Bike as used by British Cycling to test cyclists power ratios and functional threshold tests which we can use to extend our bike fitting services. Why have a bike fit? If you already have a bike and if you have not been professionally fitted to the bike then a professional bike fit could improve your cycling efficiency. If you get sore arms, shoulders, back etc during a ride then maybe you bike is not fitted to you correctly. A professional bike fit could improve this. Our professional bike fitter Nick has provided over 1000 bike fits, he studies articles published throughout the world on different techniques. If you are going to purchase a carbon road bike costing a few thousand pounds then you want it to fit correctly, with the bike fit jig, software and watt bike combination we believe at Hooked on Cycling we are the only bike shop in Scotland that can offer this service to an extremely high level. We believe we have a unique service and setup in Scotland. We also offer an electronic LOOK Keo cleat fitting service, getting your cleats in the exact position is critical if you do not want to experience knee problems in the future. The state of the art Look cleat fitting system expertly locates the precise position fore and aft and angular position. Whenever you purchase any type of bike from Hooked on Cycling we provide a manual bike fit. If you purchase a road bike, we will provide free of charge a professional bike fit using the fitting jig and software. Any person purchasing any bike from Hooked on Cycling will be provided with a free post purchase manual bike fit which includes setting up saddle height, saddle for-aft adjustment etc. 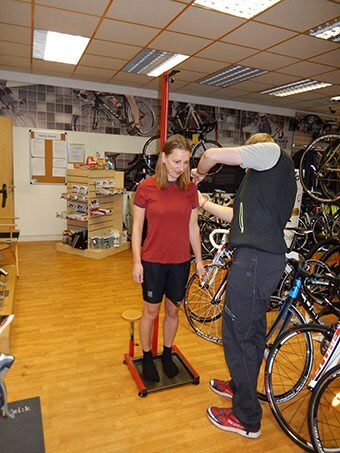 On our professional bike fitting jig we shall take various body measurements and use sophisticated software to determine your exact bike set up. Using the data from the software we shall position your saddle to the correct position. We shall then analyse your pedal stroke and determine from side-wards and front/back view that you have a smooth pedalling motion with no hip rotation or knee misalignment. With wedges and shims we can often resolve these issues but to fit these you shall need an assessment from a trained physiotherapist first to determine any leg length discrepancies. The fitting of wedges and shims is provided at an extra cost. Once we have these items resolved we then move onto the handlebars and brake levers to get these positioned correctly for your type of riding. The bike fitting process can take up to 2 hours. If you pay for a professional bike fit before your purchase we shall refund the bike fit when you purchase your bike from Hooked on Cycling. We use our professional expertise to interpret the data for exact fitting. We do not provide any data for the customer to take away. Bought a bike, you feel uncomfortable while riding or you feel a lack of power, then maybe the bike has not been fitted correctly to you. For additional services using our Watt bike click here. Includes the professional bike fit, spin cycle and power to weight ratio. Using the Watt Bike as part of the bike fit allows us to make fine adjustments to try and improve spin cycle and power to weight ratio. This service is offered free of charge if you purchase a pair of road cycling shoes and Look pedals that are not discounted in price at all. You need to bring your bike with you for the fitting to take place and the process will take about 45 minutes.